Verdun, Douaumont Ossuary, 22 September 1984. 30 years ago, the photo of François Mitterrand and Helmut Kohl holding hands in Verdun, the emblematic battlefield of World War One, went around the world. It is true that their gesture – which Kohl always insisted was a very spontaneous one – was quite unusual. Still, it was appropriate. After all, reconciliation between France and Germany, a collective effort that was both bottom-up – through hundreds of town twinnings initiated by civil society – and top-down – through an innovative treaty conceived by visionary politicians – has been just as unusual an achievement in human history as the gesture it produced in Verdun on 22 September 1984. In 1984 it was less than thirty years since the Treaties of Rome had been signed. The EU was still called the ‘EEC’ – European Economic Community – and counted only ten members. Jacques Delors was not yet appointed at the head of the Commission and the big single market was nothing but a dream. The Berlin Wall, on the other hand, appeared more solid than ever and, clearly, here to stay. 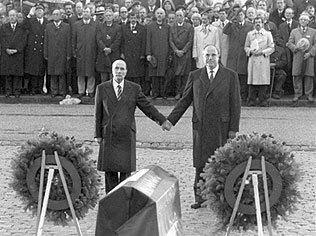 At this time Kohl’s and Mitterrand’s gesture illustrated the founding narrative of the European project: reconciliation over the graves left by devastating and fratricidal wars, the setting up of an institutional system ensuring peace between former enemies and based on the common recognition of de facto interdependence, and the hope that mutual solidarity and trust would emerge from the shared memory of a painful past. Over the last decade, it has become fashionable to claim that this founding narrative has become obsolete. The argument that is almost systematically put forward by politicians, editorialists and intellectuals – and since 2013 even by the Commission itself – is that for the young generations of Europeans peace goes without saying anyway. By consequence, the argument goes, Europe ‘needs to tell a new story’, invent a new narrative, give European integration a new reason of being. Such requests are generally accompanied by a reminder that the Union now counts twenty-eight member states and that the French-German (hi)story, whatever its merits in history can no longer serve as the foundation for a narrative and a vision shared by all. Very convincing, very much in line with modern practices of political marketing and communication. Still, I have serious doubts. And I cannot help but consider that the present reminds us in several ways of the continued relevance of the old peace narrative. On the one hand, the events in Ukraine show us that peace is never definitely acquired. If Ukraine seems far away to you, ask the Balts, all of whom are members of our Union, our Treaty and our single market, what they think of it. And if you consider Europe weak and incapable of defending itself militarily, ask yourself whether the refusal of armed confrontation on its continent and the insistence on negotiation and dialogue, including severe economic sanctions, is not precisely a lesson learnt from the past and the peace narrative interiorised. On the other hand, 2014 is also a year where commemorations of European wars abound: the 70th anniversary of D-Day in Normandy was quickly followed – from Sarajevo to Flanders – by the centenary of the outbreak of World War One. And these are commemorations that have a significant echo in society: never have I seen as many people from as many different countries on the beaches of Normandy as this summer. One may reasonably assume that they return home from the museums, the memorials and the cemeteries with a different look on the reason of being and utility of a European Union, whatever the criticisms it may deserve in daily life. That young people should be insensitive to the founding narrative of sustainable peace obtained through the means of economic and political cooperation and the sincere will for reconciliation, is a myth. The hundreds of multinational student groups that my colleagues and myself have taken to see these sites of memory over the last twenty years, have all been strongly marked by the experience. It gave them a different foundation for their studies of the existing Union of the 21st century. The initial founding narrative of contemporary Europe has lost nothing of its pertinence. It is not a kind of ‘Franco-German prism’ that excludes other experiences and perspectives. Quite the contrary: it is simply a formidable idea – a grand vision formulated among others by Winston Churchill in his famous speech of 1946 in Zurich – which was realised against all odds and without which there would never have been a European Union with whatever number of member states. It is a hope that has become reality. If this is not the stuff from which robust, inclusive and sustainable narratives are built, what is? This entry was posted in Democracy & Citizenship, Society & Culture, The EU. Bookmark the permalink. One Response to Is the peace narrative really obsolete?